Turning 30 is a big deal! It’s an even bigger deal for twins! 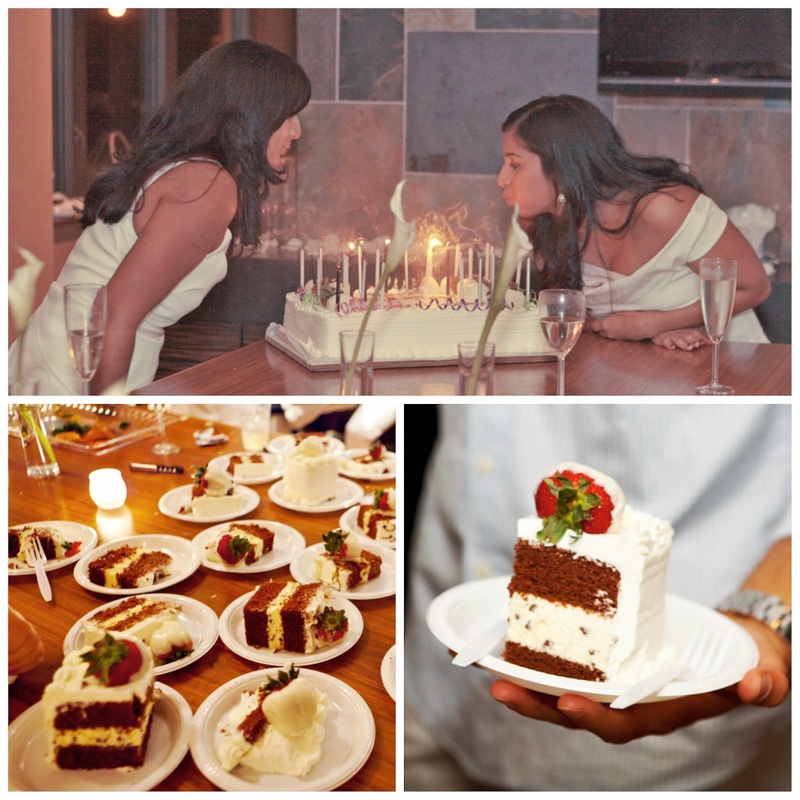 We wanted to make this birthday extra special by hosting an elegant white party. This is a great theme for the summer and photographing everyone and everything in white is visually stunning. 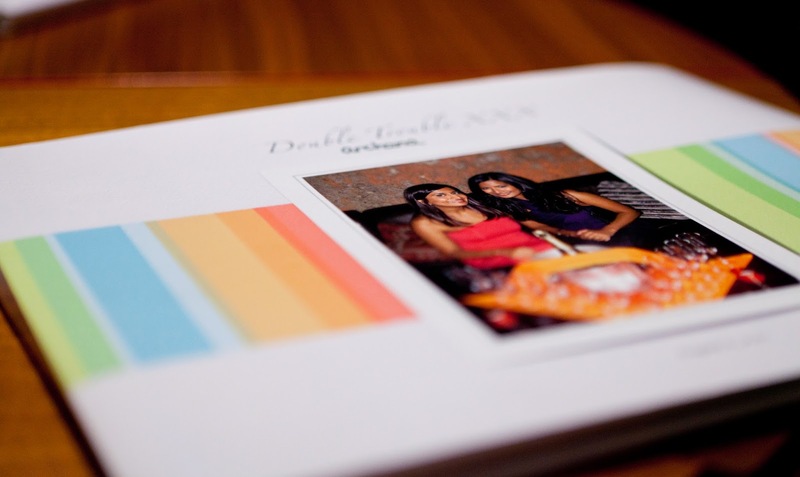 Working with a single color also makes the party planning easier! Most white parties simply require guests to wear white. We took the party to the next level by utilizing white decorations, food and beverages. We focused on white decorations but also added black and silver accents. Michaella Holden created beautiful floral arrangements using white delphiniums, hydrangea and calla lilies. 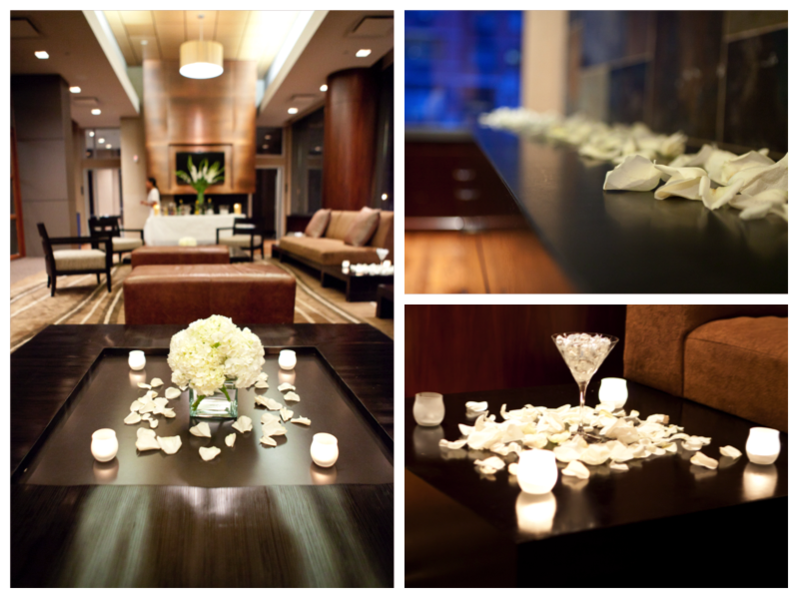 We sprinkled white rose petals and white candles throughout the room. We filled martini glasses with Hershey kisses. 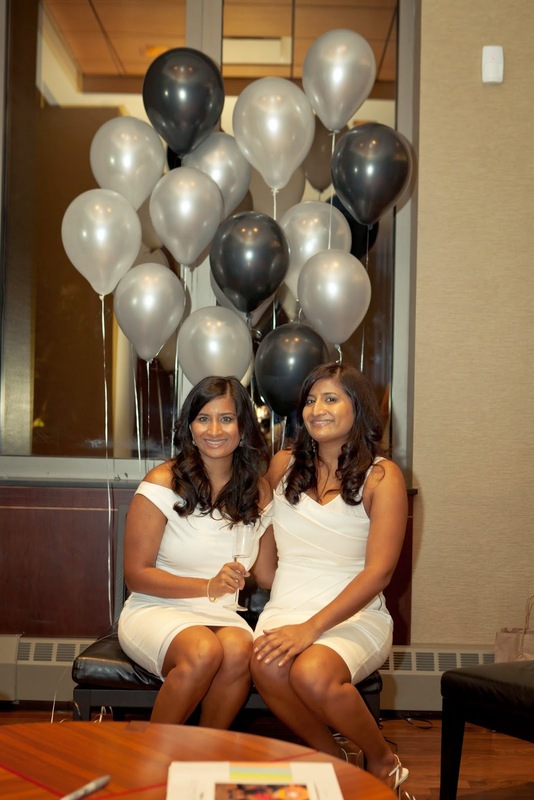 Party City created adorable white, silver and black balloon arrangements. Even our linens, cutlery, platters, plates and napkins were white. The menu largely consisted of white finger foods. 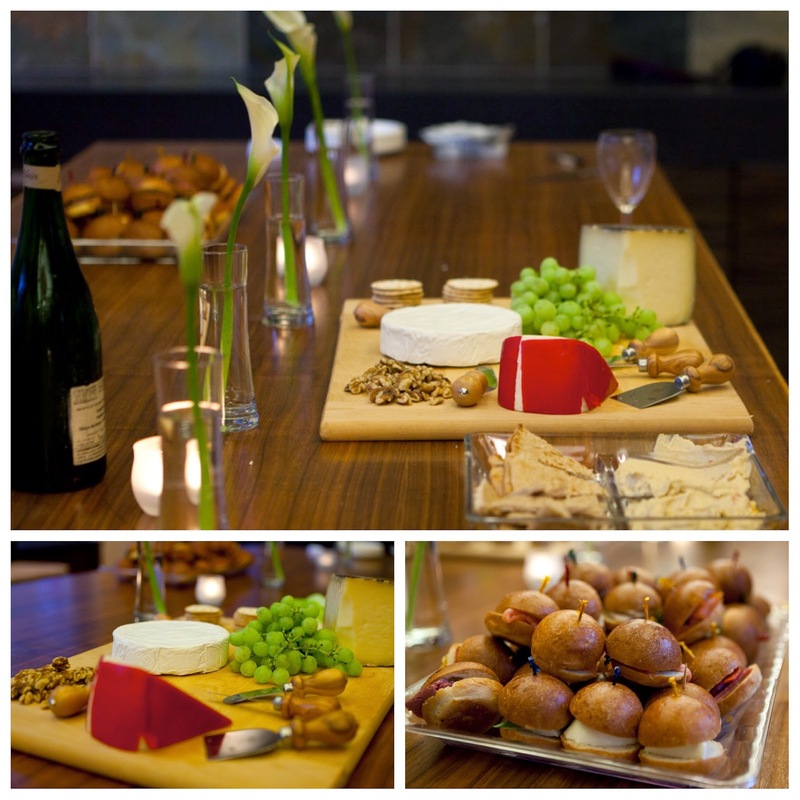 We created a delicious cheese spread with brie, manchego, fontina, walnuts and grapes on a large wooden cutting board. We also used our wooden Williams Sonoma cheese knives. We served assorted brioche sandwiches, mini pizzas, chicken quesadillas, quiches, spanakopita and pita with hummus. For more formal parties, hiring staff frees the hosts to mingle with guests and enjoy the celebration. 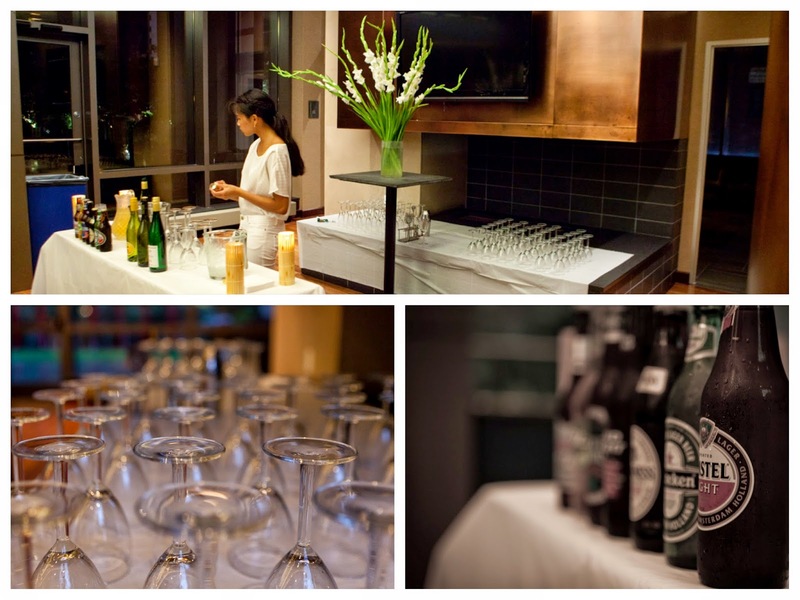 The bar was stocked with riesling, sauvignon blanc, prosecco and assorted beers. No 30th birthday party is complete without a signature cocktail. Since there were two birthday girls, we had two signature drinks: white cosmopolitans and white sangria. Serving drinks that don’t have to be made on the spot, such as beer, wine and premixed cocktails, will keep the line moving and the booze flowing. We invested in some inexpensive stemware from IKEA. Plastic cups just don’t carry the same elegance as wine glasses and champagne flutes. From our experience, the cost of renting stemware and buying stemware is fairly comparable. For dessert, we ordered a decadent chocolate cake filled with white chocolate mousse from our favorite bakery, Mother Mousse. Trust us, the cake was absolutely delicious. Some guests even admitted to taking two pieces! We also served guests white chocolate covered strawberries. A white party may not be the most outrageous theme, but it makes for cute pictures and that’s all that matters, right? This birthday party was particularly memorable for the birthday girls and their guests. We loved reading the birthday wishes in our guest book. At the end of the night, everyone asked what color we’d do next year. And with that, the color themed parties were born! Previous Post Coloring Your Birthday!